Harmon Quarter Horses goal is to produce good working ranch horses that have the brains, speed and athleticism to be competitive in the arena as well. Harmon Quarter Horses is located in Chester, Montana at the heart of the Big Sky’s Hi-Line. Their home place is just south of town and they summer their cattle in the Sweet Grass Hills north of town. The Harmon Quarter Horses original broodmares carried the bloodlines of Vegas Hardway, Doc Bar, King, Poco Bueno and Blondys Dude. They added the bloodlines of Two Eyed Jack and Jag On through their first stallion, Jack N Jag, which Bill purchased in 1980. The addition of Zippo Memorial, an own son of Zippo Pat Bars, to the breeding program in 1995 brought in the Three Bars and Leo influence and also added another shot of Poco Bueno. By keeping daughters of Zippo Memorial, the Harmon's created a solid pedigree to complement the bloodlines of Sun Frost, The Continental and Driftwood that their stallion, Dun Drift, carries. With the purchase of several mares, they added crosses to Royal Three Charge and Snip O Colonel. The Harmons used "Ike" for general ranch work when he was young and not out in the breeding pasture. He was well mannered and easy to have around home. Most of the time, they just turned him in with the rest of the saddle horses. Now he usually runs out with his mares all year long. 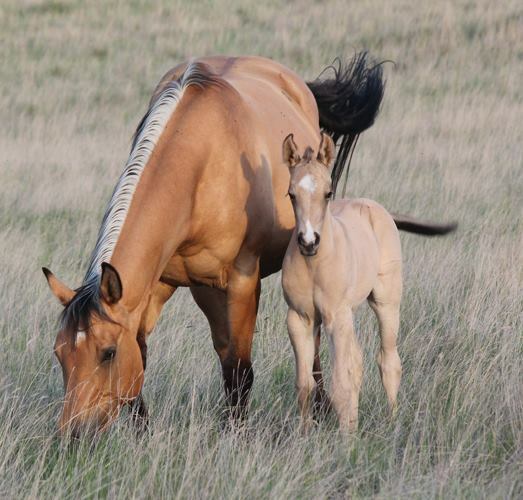 Dun Drift’s offspring have proven themselves in many areas including on the ranch, on the trail, in the branding pen and in the arena. The Harmons currently have four daughters in their broodmare band, two mares running barrels and poles in Tennessee, and six offspring in their saddle string. Some of Ike's offspring will be available for purchase at the Montana Breeders Group 2017 Sale, held September 9, 2017 in Great Falls Montana. Harmon Quarter Horses most recent addition is Signature Perks, an own son of Dash For Perks. They are very excited to see this cross on the Dun Drift daughters. Signature Perks foals have size with plenty of foot and bone. They are proving themselves as both rope horses and barrel horses with speed, athleticism and good minds. Harmon Quarter Horses are proud to be some of the featured consignors at the 20th Annual Montana Breeders Group Sale, September 8, 2018. Click here to find out more about the sale!